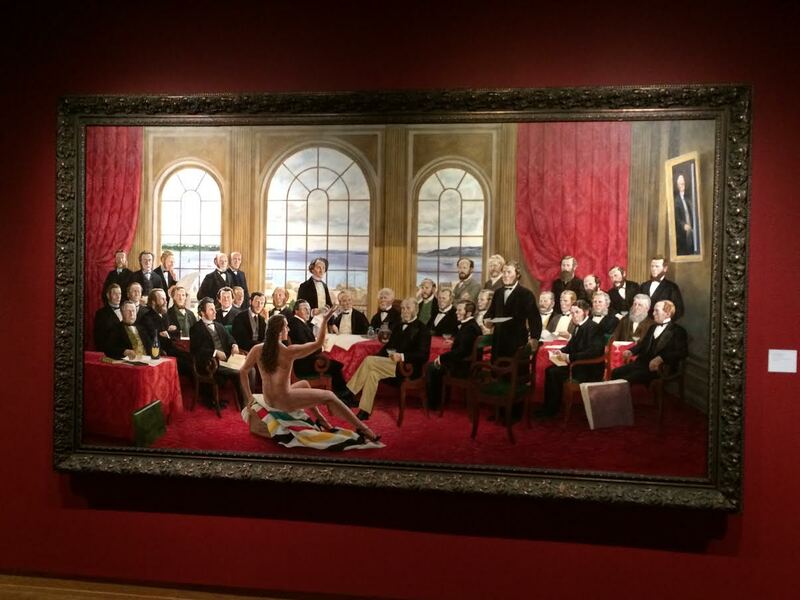 Kent Monkman is a trickster, no question about it, and in this newest installation, Shame & Prejudice: A Story of Resilience, he has proven that he is a trickster with a tale. Biting wit informs the paintings, installations and dioramas that are included in this show, but here is also tenderness and pain for his ancestors – beaten into submission and invisibility by colonization, colonialism and intolerance. 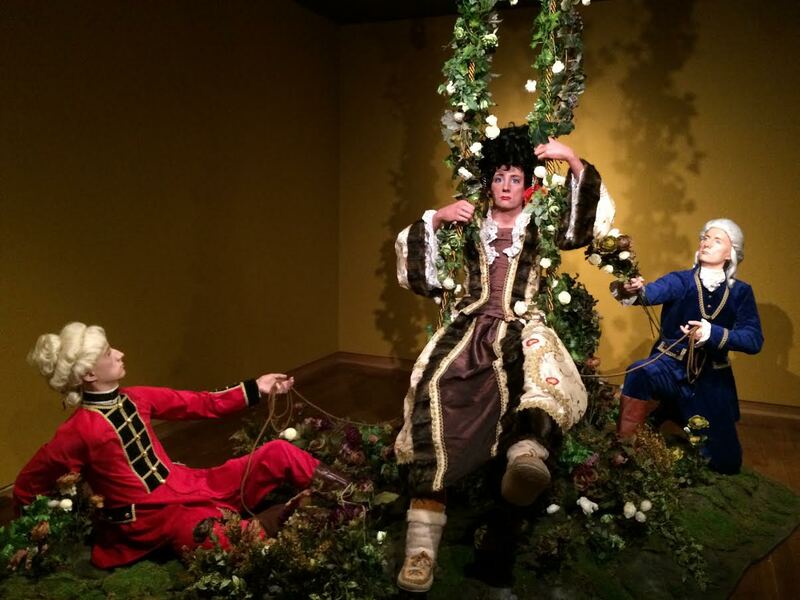 For those unfamiliar with the Canadian art scene, Monkman, whose ancestry is both Cree and Irish, has been creating art in various forms for about 25 years, through painting, film, mixed media, and performance. His alter ego is Miss Chief Eagle Testickle, a cross-dressing, time travelling, performance artist whose drag costumes are always meticulously curated and outrageously camp. Shame & Prejudice was commissioned by Barbara Fischer of the Art Museum at the University of Toronto, and will travel to nine other venues this year in commemoration of the 150th year of Canadian confederation. The exhibit is organized into nine themes – the “urban rez,” sickness and healing, the “rez house,” incarceration, forcible transfer of children, starvation, wards of the state, the fathers of Confederation and New France – each beginning with an explanation by the artist (in English, French and Cree) of the intent of that segment’s paintings, accompanied by artifacts and supporting materials. Monkman’s grandmother was sent to a residential school, but she never talked about it, a not unusual situation for many families who were torn apart by the inhuman school system for aboriginal children in Canada that existed between 1880 and 1976. Residential schools were government-sponsored schools established to assimilate Indigenous children into Euro-Canadian culture. Although residential schools are usually considered part of the assimilative policies that the Canadian government directed at Indigenous peoples from the 1880s onward, the schools were set up and run by Roman Catholic, Methodist and Anglican dioceses. 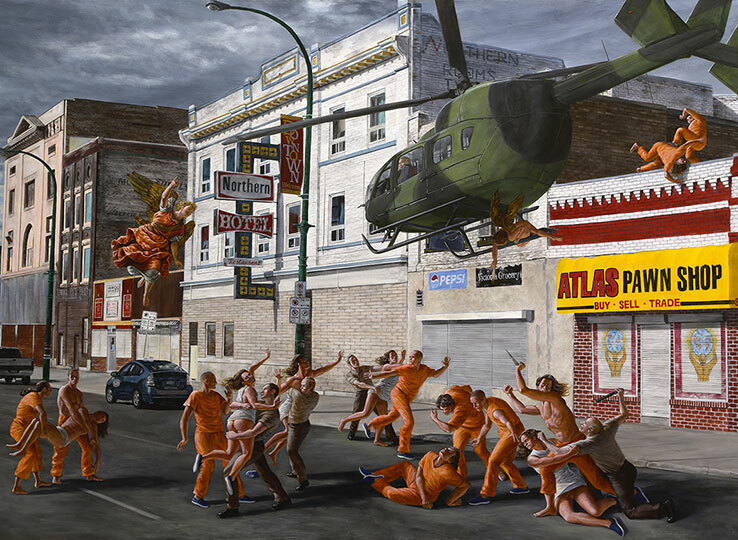 Monkman’s pictorial commentary on this theme is a fairly straightforward pictorial rendering of children being torn from their families by religious personnel and several Canadian Mounties – who embody Canada as an iconic symbol of government. 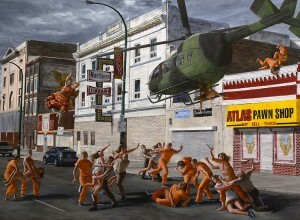 Other paintings in the exhibit are not so straightforward, there are scenes of modern streetscapes, recognizable as Canadian through their neon signs and distinctive types of architecture, but these paintings are subverted with the addition of angel figures, and abstract Picasso-esque renderings of women. There are also distinctly Canadian animals – bears, beavers – sometimes oddly juxtaposed with men who are killing or fighting them. And sometimes Monkman himself is represented in the person of Miss Chief – engaging with other protagonists within the frame. All of the paintings, as well as the two brilliant dioramas: “Scent of a Beaver” which reproduces Jean-Honoré Fragonard’s “The Swing,” and “Love Conquers All” which depicts the Holy Family in a rez house; draw on classical styles of painting from the 19th and early 20th centuries. Monkman has clearly thoroughly absorbed European Art History, and then used it to express his own, very distinctive, point of view. The archival documents, supporting paintings, and artifacts, including religious art, leg-irons, moccasins, and cradleboards, echo the messages delivered by the paintings and can seem redundant, but they also give the viewer a pleasant pause in the flow of the exhibit. The “table of plenty and starvation” in the middle of the final gallery reminds one of similar traditional museum displays, but subverts the genre once again to make a point about colonialism and desperation. 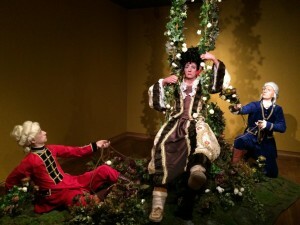 Monkman has previously used all of these themes in his art, but it comes together in this exhibit. It is a fitting tribute to his ancestors, and will certainly be worth visiting more than once on its journey across Canada.